I absolutely love Westerns. Much as I love most genres of movies, if you gave me a choice between say, a Science Fiction and a Western or a 1940’s Murder Mystery and a Western or a Woody Allen comedy and a Western, 9 times out of ten I’ll take the Western. It’s a genre I grew up watching mainly because my parents were also in love with Westerns and one of my favorite childhood memories is when my father took me out to dinner at a fancy Chinese restaurant and then we went to see “The Wild Bunch” And my personal list of My Favorite Ten Movies Of All Time includes not only “The Wild Bunch” but also “Once Upon A Time In The West” which I think is the greatest Western ever made. Lawrence Kasdan and his brother Mark were major Western fans since they were kids and really wanted to make one. Lawrence used every bit of clout he had to get the film approved and I’m glad he did because SILVERADO is a magnificently huge Super Western that looks, feels and sounds as if it had been made back in the great heyday of Westerns when guys like John Ford and Howard Hawks were doing their thing. The story is one that I’m pretty sure has every convention and set piece you can think of in a western: gunslingers, barroom brawls, homesteaders being run off their land, sneaky gamblers with derringers up their sleeves, crooked sheriffs, saloons, cattle stampedes, wagon trains, pretty widow ladies, outlaw hideouts, evil cattle barons, gunfights on Main Street at high noon. 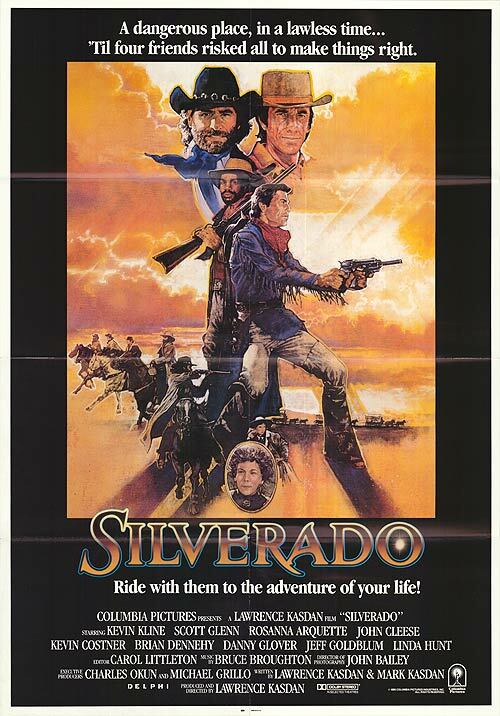 The only thing lacking in SILVERADO is an Indian uprising but I’m pretty sure that if Mr. Kasdan could have found a way, he’d have had that in there as well. Emmett (Scott Glenn) is making his way home after spending five years in prison for killing a man in self-defense. After successfully fighting off an ambush by four desperados trying to kill him, he meets up with Paden (Kevin Kline) who was robbed of his horse, ivory-handled guns, stylish all-black outfit complete with beloved silver banded hat and left to die in the desert. The two men hook up and after making a pit stop at an Army fort where Paden gets back his horse and runs into a pair of old buddies, Cobb (Brian Dennehy) and the psychotic Tyree (Jeff Fahey). From there they go onto the town of Turley where Emmett’s goofy kid brother Jake (Kevin Costner) is going to be hanged come the morning. They take time to help keep Mal (Danny Glover) out of Sheriff Langston’s (John Cleese) jail and after Emmett and Paden bust Jake out of jail Mal returns the favor by using his sharpshooting skills with a Henry rifle to chase Sheriff Langston back to town. The four heroes then proceed to have a wild series of adventures that include rescuing a wagon train of homesteaders stranded in the wilderness and taking on a band of thieves who have stolen the life savings of the wagon train. Mind you, all this happens before we’ve even gotten to the town of Silverado, which is being controlled by the ruthless cattle baron Ethan MacKendrick (Ray Baker) who has hired Paden’s old pal Cobb to be Silverado’s Sheriff. Cobb is harassing the homesteaders to leave and if they don’t they’re burned out and killed, like Mal’s parents. It isn’t long before the four friends are pulled apart by their own separate conflicts and loyalties but soon come to realize that if there is to be any justice in Silverado, they are the ones who will have to join back together and make it. Now that’s the bare bones of the story but there’s a helluva lot of subplots going on because this is a mollyfoggin’ huge cast Kasdan is working with and each of his four leads are just that. They’re all leading men and Kasdan treats them that way. Danny Glover, Kevin Kline, Scott Glenn and Kevin Costner are all treated as equals in terms of skill, courage and respect. And each of the four leads have more than enough screen time to explore their motivations for having a stake in the future of Silverado. Emmett and Jake have a sister; brother-in-law and a nephew who thinks his gunslinging uncles are just the coolest. Mal’s parents were homesteaders who were run off their land and murdered while his sister Rae (Lynn Whitfield) has willingly become a prostitute in town, hooked up with the local gambler, Slick Calvin Stanhope (Jeff Goldblum). Paden is torn between his loyalties toward his old friend Cobb and the wild life he used to lead and his new friends who are men of honor and respect. His growing friendship for Stella The Midnight Star (Linda Hunt), Cobb’s partner in the town’s largest saloon and prostitution emporium is also a large factor in his eventual decision. And both Paden and Emmett have a stake in what happens to the homesteaders as they’re both attracted to the extremely pretty and recently widowed Hannah (Roseanne Arquette) who likes the both of them a whole lot and is grateful to them but makes it perfectly clear that men who tell her she’s pretty come along every day. She’s looking for a man willing to help her work the land, make things grow and build a stable life. Like I said, you would think that with this many subplots, characters and settings that SILVERADO would be a confused mess but nothing could be further from the truth. The first half of the movie is a road trip in which we’re introduced to most of the characters so that by the time the wagon train, along with Emmett, Jake, Paden and Mal arrives in Silverado, we already feel as if we’ve been on the trail with these guys and feel comfortable with what’s going on. And once they reach the town itself, the rest of the characters are integrated smoothly into what we already know. It’s a remarkable job of writing and directing that shows that you can have a large cast and multiple storylines and not have the movie feel crowded or rushed. The acting in this movie is top-notch. I don’t think I can remember right now a movie with this large a cast who were all so good. Scott Glenn and Kevin Kline are at the top of the list with performances that I believe they based on Gary Cooper and Errol Flynn, both of who made more than their share of notable westerns. Kevin Costner’s Jake is a goofy daredevil who is the best horseman and gunman out the four but who tends to get into trouble for kissing the wrong girls. Danny Glover’s Mal is not portrayed here as a sidekick to his three white co-stars but is a hero in his own right and I really liked his scenes with Kevin Costner’s Jake and in those few scenes they had a real rapport together that made me wish they had a few more together. 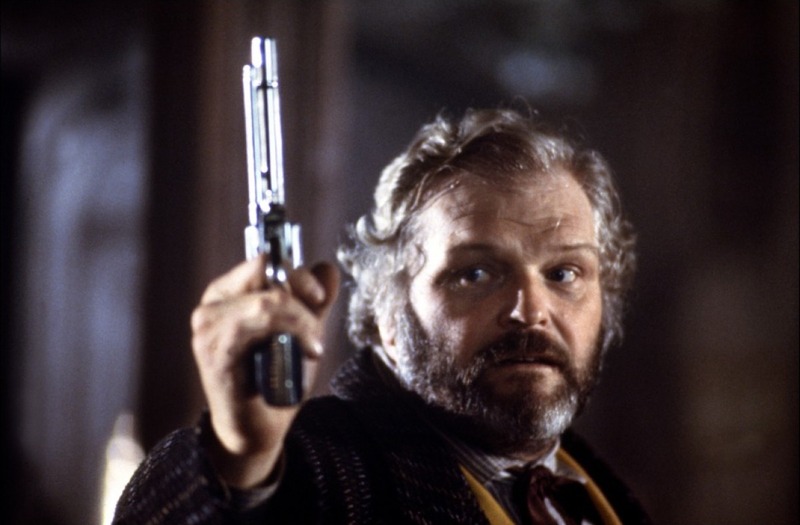 Now you all know how I love movies that have bad guys who love being bad and this movie is chock fulla them, led by Brian Dennehy’s Cobb who goes through the whole movie grinning from ear to ear behind a bristling white beard. The secret to any good bad guy is this: he doesn’t think he’s the bad guy and Brian Dennehy must understand that because Cobb is extremely likeable. Sure he burns out innocent families and kidnaps kids and murders without a second thought but he’s just such a damn nice guy while he’s doing it. Jeff Goldblum is a real surprise. As the gambler Slick he is dashingly elegant and even though he has only a few scenes he makes ‘em work. 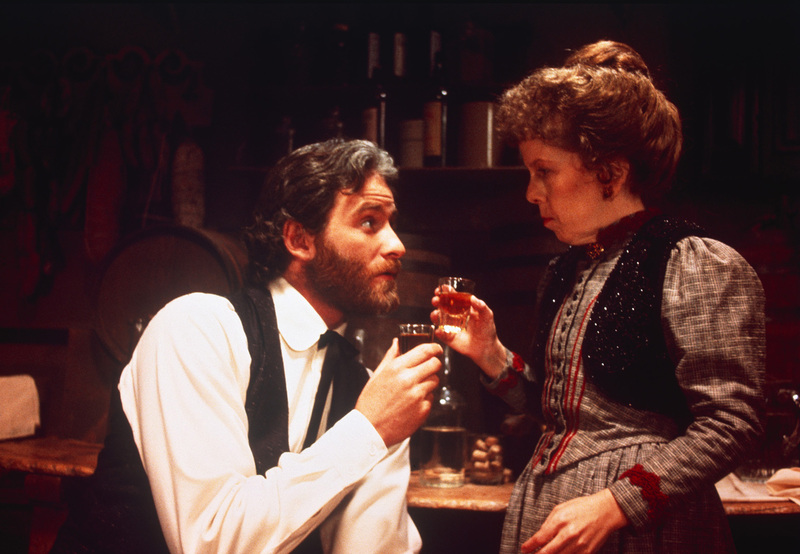 Linda Hunt as Stella absolutely steals every scene she’s in and the relationship between her character and Kevin Kline’s is really sweet and feels genuine. Who else is good? Joe Seneca. Earl Hindman. Pepe Serna. Brion James. James Gammon. And that beautiful musical score by Bruce Broughton is just perfect. If you’ve seen SILVERADO then you’re probably a fan of it and if you aren’t, I urge you to go back and see it again in a new light. It’s the Western I recommend to people who claim they don’t like Westerns and after they see it most of ‘em come back to me and say that, yeah, they liked it a whole lot. Know why? Because at it’s heart SILVERADO is about four gun-slinging, hard-ridin’, two-fisted heroes riding from town to town having adventures and bringing justice to The Old West and if you can’t find it in your heart to like that then I’m sorry, amigo, you just ain’t got no heart. Well, hopefully I’ll get around to this movie soon. The others you recced have been good. I love this movie so much its not even funny. Thanks for such a great review, Derrick! I totally agree with everything said. This is one damn good Western, which I can watch over and over. The acting talent assembled, the story, the direction, heck, everything about the film is top shelf. The only disappointment? Being totally crushed that there was never a sequel! Especially after Jake yelled that last line, “We’ll be back!” at the end.